Over the years I have met countless business owners. And the ones I enjoy meeting most are those who positively exude passion and energy for their business, are excited and enthusiastic about what the future holds, and simply need an expert marketing guiding hand to help them achieve this precious business vision. Believing in yourself and your business is probably one of the biggest steps towards success (equally, lack of belief is one of the biggest barriers). I’m not talking about blind faith or blissful ignorance – after all, passion for what you’re doing has to be balanced with a measure of pragmatism and you need to be realistic in your approach to business and if there is indeed, a market for what you do or offer. But believing that you can achieve success really is half the battle. I left the corporate world and set up my own business a few years before the recession hit. Everyone around me gave me plenty of warnings about how hard it would be – from concerned parents to sceptical colleagues – and I knew I could potentially be risking the typical a feast or famine consulting situation. But I stuck to my guns because I knew that it was what I wanted and that I would be good at it. Now if I didn’t feel passionate about, and committed to, my business and my clients that I can help, I would have packed it in the minute the UK started to slip into recession. I don’t mind admitting that it hasn’t always been easy, but would I prefer to be receiving a payslip every month? It’s a very big and emphatic ‘no’! If you truly love your business and what you do, then you stand every chance of survival and success. It’s all about knowing what’s good for your business – having a clear vision, knowing what you want to achieve, planning what you need to do, and having the desire and motivation to throw yourself (with that focus!) wholeheartedly into every single working day. It’s a feeling that makes it worth getting up every morning – I would hate to begrudge every effort to improve my business and I don’t think that kind of attitude is sustainable in the long run. So show your business the love it deserves and you’re bound to reap the rewards. 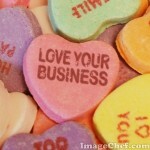 Why do you love your business?It would be great to hear your thoughts.